‘If it’s in a word. Or it’s in a look. 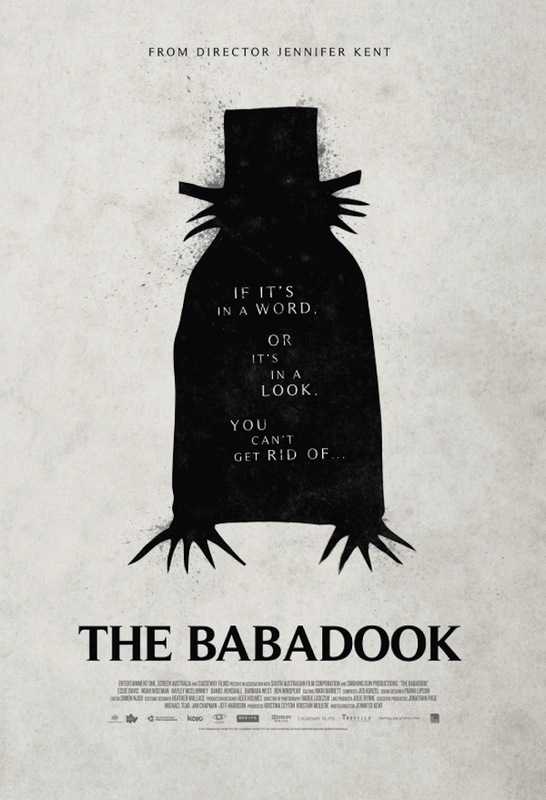 You can’t get rid of… The Babadook’. Grief is one of the most powerful experiences a human can go through. It can manifest itself in a myriad of different ways. It could for example lead to you to resent and dislike your own child, to see the ghost of your dead husband and relive his death over and over again, to subconsciously invent a demonic figure that represents all your pent up feelings, to unknowingly draw a picture book in which you are depicted as murdering your dog and child, to possibly actually murder your dog and child. These are all possible interpretations of what happens in The Babadook, an Australian horror film released last year that was written and directed by Jennifer Kent. Or maybe The Bababook is a real supernatural entity and the whole thing is a more cerebral version of a million ‘family in peril’ haunted house films (a sub-genre that truly recently bottomed out with A Haunting In Connecticut 2: Ghosts of Georgia). Or maybe it’s both. The number of explanations and analyses one can have over the events in The Babadook isn’t a criticism. Being spoon-fed every tiny detail and clue to mystery is boring, unentertaining and a little bit insulting. The Babadook is not boring, it entertained the hell of out me and it assumes its audience has an IQ higher than that of a turnip (Three counts which Ghosts of Georgia definitely failed at). The plot centres on single Mum Amelia (Essie Davis), who tragically lost her husband in a car crash while he was driving her to the hospital to give birth to their son. Seven years later, and she hasn’t even begun to come to terms with it. Her son, Samuel (Noah Wiseman), is a handful and ‘different’ to other children. He is obsessed with and terrified by monsters and yet one day a book appears in his room called The Babadook. It’s as if Tim Burton designed a Ladybird book and it is chilling. 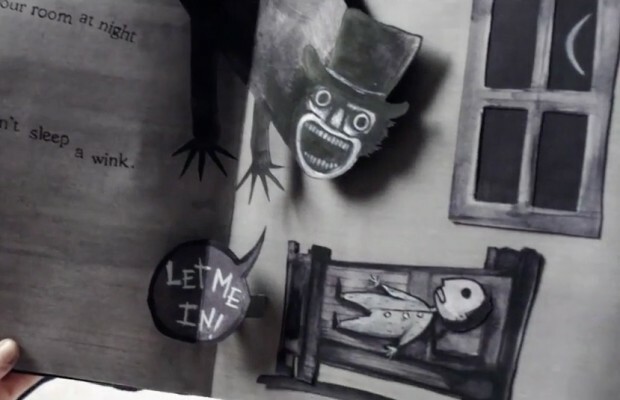 Once the book has been read, Mr Babadook starts infiltrating Amelia and Samuel’s lives in a fashion that is very unsettling (and isn’t a series of pointless jump scares for 90 minutes. Yeah, it’s possible. Who knew?). Amelia dismisses Samuel’s sightings of The Babadook as overactive imagination, until strange things start happening to her as well. The book reappears from the bin with some new chapters, which now contains graphic pop ups of Amelia murdering Samuel and their dog, Bugsy. She burns it and attempts to get help from the police, but to no avail. Her sister doesn’t want to know as Samuel pushed her daughter out of a tree house (well deserved push though, she was a right little brat). Alone in the house with Samuel, the presence of the Babadook gets more and more pronounced until Amelia, now ‘possessed’ by the creature kills the dog and attacks Samuel. Borrowing from the Nightmare on Elm Street school of trapping bogeyman, the plucky lad has rigged up a series of assaults for his Mum/Babadook. He ties her up and convinces her that she can fight the demon inside her. Having expelled the Babadook mother and son retire to bed. But the creature will not give up that easily. When he attempts to take Samuel Amelia’s mothering instinct finally kicks into gear and she defeats the monster. Only to keep it in the basement and feed it worms while her and Samuel finally have a happy life together where he gets a birthday party and is amazing at magic and she finally moves on from the death of her husband. Fin. That is a very linear, mainstream account of the film, and one that makes it sound like the Babadook is a lot more prominent of a character than he actually is. And no, the explanation that the Babadook is a manifestation of Amelia’s grief and resentment towards her son and was never really ‘there’ anyway is so un-taxing that you don’t even need to be able to spell ‘psychology’ to work it out. The film has more layers than that. And most of them belong to Essie Davis who is fantastic in her portrayal of Amelia. She really does deserve all the plaudits that are being thrown her way for this role. It’s a shame horror films are never recognised by film award ceremonies as she would sweep the lot in my opinion. Her Amelia is terrifying, both as a fragile, struggling woman who has been enveloped in her grief for several years, and as a ‘possessed’ monster intent on killing her son. I put ‘possessed’ in inverted commas as it is too simplistic a term for what happens to this character. If she is possessed by anything it is not by the Babadook itself, but by severe mental breakdown accumulated over the last several years. 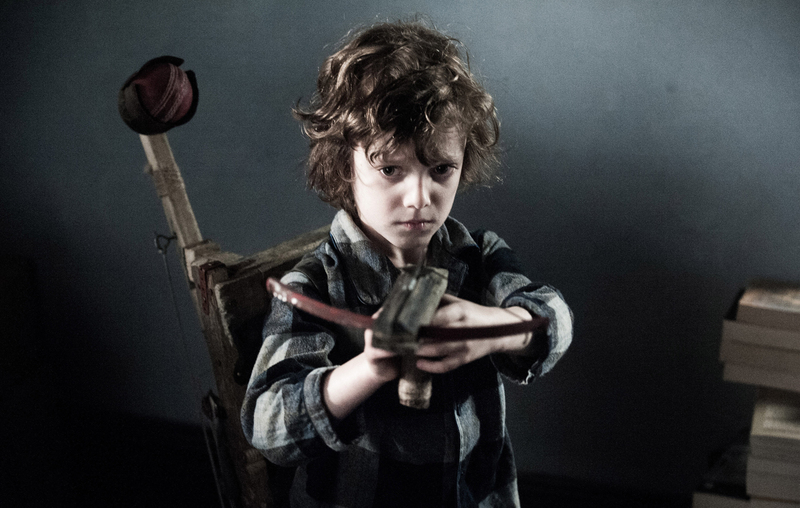 Noah Wiseman, who plays Samuel, faces the challenge all child actors must in a horror film. Namely to not be so annoying that you spent most of film’s running time wanting to punch them in the face. And he succeeds, in a very believable performance. In fact, even when he was being annoying, it works as it helps hammer home how trying and frustrating raising this ‘different’ child must be for Amelia. The film is shot beautifully, with lots of muted colours and dark, shadowy corners – Amelia and Samuel’s home, the place where they should feel most secure, reflects their own states of mind, and is not a welcoming or safe environment for either of them. The Babadook himself, although we rarely see him, put me in mind of Noel Fielding going to a fancy dress party dressed as Papa Lazarou as drawn by Tove Jannson. That sounds silly, but he is anything but, and I actually really like the design for the creature. The alternate viewpoint, that The Babadook was a real monster and was really terrifying the small family, until it’s eventual defeat and then incarceration in the basement is a valid theory. But I think it’s just not as interesting and isn’t giving Jennifer Kent enough credit for the very scary and very real world that she has created. That’s why I like the idea of both theories being true. A monster who prays on an emotionally unstable person and exploits her mental anguish in order to do her and her son harm. Whichever interpretation you decide to go with, The Babadook remains a genuinely scary and incredibly well made film and is highly recommended. Definitely one to watch when home alone, with all the lights off…But if you hear knocking don’t let him in. This entry was posted in Uncategorized and tagged Essie Davis, Ghosts, Haunted House, Horror, Jennifer Kent, Monsters, Review, The Babadook by jelliclezombi. Bookmark the permalink.